Remember my pink bathroom that literally fell apart two days before Christmas that I posted about here? We were suddenly in a hurry to make it functional again. We could have just bought a single piece insert from the home improvement store, but the design girl in me just couldn't do it. Our overarching goal is to honor the architecture of our little yellow cape and thus preserve the original charm that we fell in love with at first sight viewing. Enter Pinterest. Months before, I had casually started collecting images of ideas to serve as a jumping off point for when we got around to redoing the bathroom. 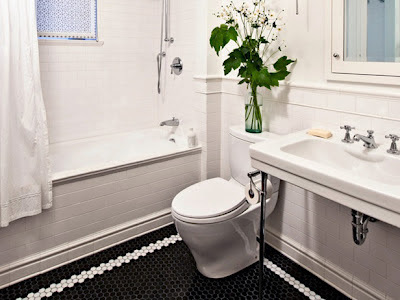 I thought I would have months to meander my way into deciding how to renovate our little and only full bath. Now I had a matter of hours. Images from here, here, and here (all via Pinterest). (I don't know if other couples share this frustration challenge, but my husband and I communicate a whole lot better when we can both look at the same image and discuss the features. 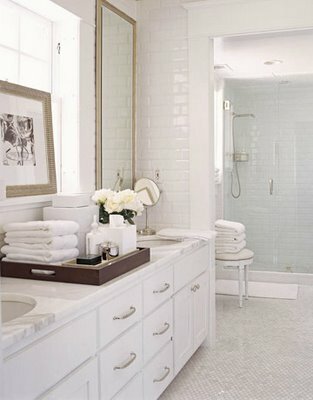 What I love about each bathroom is the tile! Each bathroom looks like a peek into a charming little country cottage. 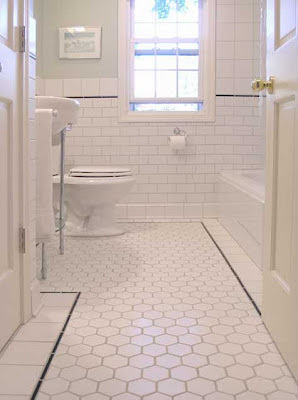 It was becoming increasingly clear, I love white subway tile. What features are you drawn to over and over again? 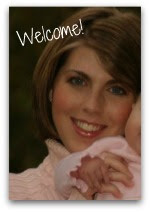 Stay tuned for the shower reveal!